The petition on Change.org, signed by over 1.2 million people and created by Nic Rumsey, claims changes made to the Snapchat app made it harder to use, with many "new features" declared to be "useless or defeats the original purposes Snapchat has had for the past years." Citing users attempting to use an earlier version of the app by various means, Reuters reports the petition urges Snap Inc to "change the app back to the basics, before the new 2018 update." 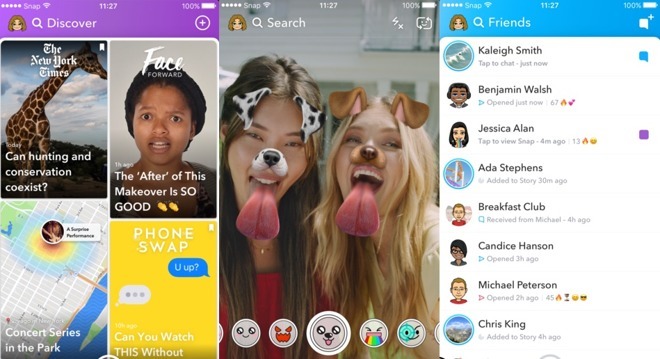 The backlash follows after Snapchat started to roll out its new design in November last year, with the main complaint being the combination of Stories and Friends into the same page, making it harder to to use both of the features. At the same time, the Discover section, used to highlight content from publishers and other online figures, was separated off into its own area. In its response to the petition, Team Snapchat wrote on Tuesday "We hear you, and appreciate that you took the time to let us know how you feel. We completely understand the new Snapchat has felt uncomfortable for many." While the response starts with an apologetic tone, the text that follows reveals Snap Inc is not going to roll back the app to a previous version at all. Instead, it will continue with its existing design but with smaller changes it hopes will alleviate user concerns. Snapchat aimed for the update to make it easier for people to connect with those they care about most, with the Friends page claimed to adapt over time to best suit how the app is being used at that particular moment. A similar personalization of content is also applied to the Discover section. New tabs will be added to the Friends and Discover pages that will help users sort content by type, rather than rely on the app's personalization efforts alone. The tabs will let users select Stories group chats, and Subscriptions, showing just those types of content and temporarily hiding the others from view. Snap Inc plans to start pushing the tab-based update to users "soon" on iOS, as well as to Android users in the coming weeks. The response ends by thanking users for their "enthusiasm and creativity," and a pledge to listen closely to users to "find new ways to make the service better for everyone." Reactions to the company's response are somewhat negative with many users writing to complain that they wanted the company to revert back to the older version instead of adding new features. Some comments also insinuate this to be a tone-deaf corporate response, noting the hypocrisy of claiming to listen to users, then seemingly not doing what they demand.